2" outside Nylon Belt with quick release buckle and adjustable waist. 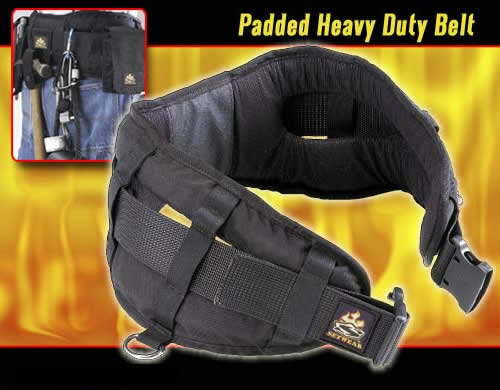 1" Nylon webbing belt support straps spread out 4" apart for easy adjustments on tool pouches. Built in Hip Bone cut outs for extra comfort and support. No slip Vinyl built in lumbar area to keep from sliding down. This belt is made for people who demand support and comfort while carrying lots of tools. Built in utility D-Rings located on each side for just about anything. Made with 100% light Breathable soft foam and durable nylon because your tools should be Heavy and not your belt.